Scrap Happens Here with Darla: Celebrating FLAG DAY! Happy Monday everyone! I hope you had a FABULOUS weekend and found something super fun to do! Yesterday was Flag Day and our little mountain town lines both sides of Main Street (also known as Highway 299) with flags. I ALWAYS love to see the flags out...one of these days I'm gonna get a picture...but I have to get up early...to get one without cars in it! In honor of Flag Day I decided to do a flag card using the two techniques I shared with you last week! Do you remember what they were? Let me refresh your memory...the one was Watercolor wash on a clear block and one was Bokeh. Here's what I came up with! I think I'll send it to a young man who went to school with my older sons and enlisted! This was such a simple, fun card to make! Just use your Stampin' Write markers to color on your clear block. My first one was backwards because I colored it on the block as you would see it...when I stamped it, I realized I had to color it backwards. It's fun...give it a try! Do you know why we celebrate Flag Day? We celebrate it because June 14, 1777 is the day the United States adopted it's first flag. 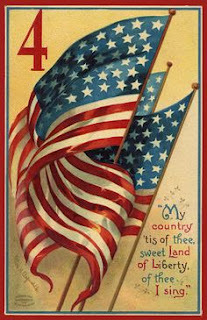 President Woodrow Wilson issued a proclamation in 1916 establishing June 14 as Flag Day. In August of 1949, National Flag Day was established by an Act of Congress. It's not a Federal holiday...but it is a celebrated day in my little town! Thanks for stopping by...and have a FANTASTIC day!